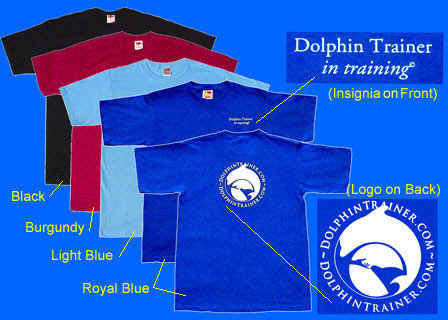 * Our famous "Dolphin Trainer in training"T-Shirt is easily our most popular garment. It is available in Black, Burgundy, Light Blue and Royal Blue. All colors feature our our famous six inch diameter DolphinTrainer.com Silhouette Logo on the back and our "Dolphin Trainer in training" insignia on the front left chest area. These finest quality 100% cotton shirts are professionally silk screened with white logo and lettering, and are just $15.95 (plus S&H). 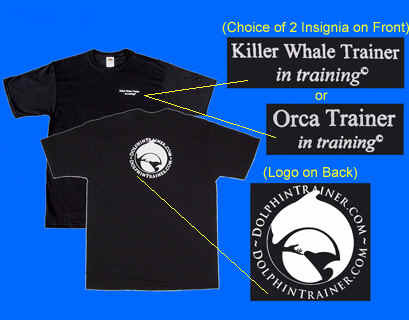 * For those who like their cetaceans a little bigger we offer our very popular "Killer Whale Trainer in training" and "Orca Trainer in training" T-Shirts. These finest quality 100% cotton shirts feature either of these two distinctive insignia designs on the front left chest area and our six inch diameter Silhouette Logo on the back. These professionally silk screened shirts come standard in black with white logo and lettering (the striking natural colors of killer whales (Orcinus orca). Both insignia styles are just $15.95 each (plus S&H). 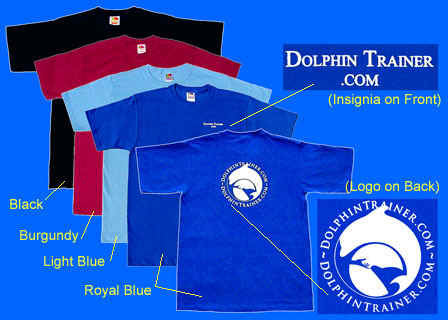 * We've also added three new colors to our original "DolphinTrainer.com" orgainizational insignia T-Shirts. Now available in Black, Burgundy, Light Blue and Royal Blue. 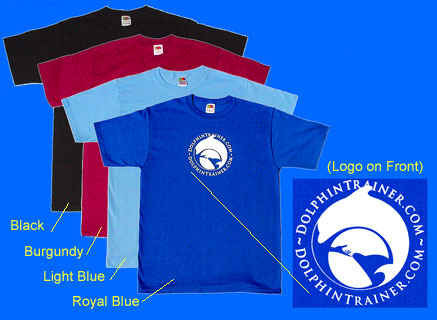 All colors feature our our famous six inch diameter DolphinTrainer.com Silhouette Logo on the back and our " DolphinTrainer.com" Insignia on the front left chest area. These finest quality 100% cotton shirts are professionally silk screened with white logo and lettering, and are just $15.95 (plus S&H). * For those who prefer the logo on the front, we proudly offer this T-Shirt style. Our finest quality 100% cotton shirts professionally silk screened with our six inch diameter Official Silhouette Logo on the Front. Available in Black, Burgundy, Light Blue and Royal Blue. All colors and sizes are just $14.95 (plus S&H). Actual size of all chest insignia is approximately 3 inches long. Our DolphinTrainer.com logos were designed to symbolize the contact and close personal relationship that trainers must developed with their animals, to achieve success. We spent months refining the artwork and working with professional silk screeners to ensure that these shirts would be both beautiful and durable. We are really happy with the results and offer a Money Back Guarantee that you will be too. We've taken a lot of time to select and work with only the most reputable professional silk screening companies to produce these high quality T-Shirts. We are very proud of the results and believe you will be too.